If one takes three individuals and interviews them with respect to life changing experiences and how they relate to education what would one expect to find? Certainly these people would speak about moments of educational challenge and inspiration, or times where their goals have been unachievable or misdirected. Perhaps they would suggest ways in which learning has been an escape route from the perception that circumstances are pre-determined. This paper represents a search for these pedagogic epiphanies. They are located in the narratives of three people - and they are loaded with subjective principles in terms of the relationships that these narratives may build with pedagogic experience (Clough, 2002) and skills, and the definition of a subject area about epiphanies and teaching and learning. It is critical that this paper relates the three narrative strands to a theoretical stratum that embeds and grounds them without diminishing their singularity. 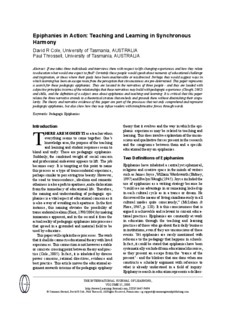 The theory and narrative evidence of this paper are part of the processes that not only comprehend and represent pedagogic epiphanies, but also show how they may infuse readers with transformative forces through words.